Traction devices have been around for years. Perhaps the best known are the classic "traction bars" that bolt to the bottom of the springs and / or axle. As the axle tries to rotate under acceleration, these bars contact the underside of the spring and help stop the pinion gear from trying to climb the ring gear and in the process provide a modest increase in traction. See figure 1. Although these devices aren't 100% effective they do work pretty well. On a street rod or vehicle that may have less ground clearance than your ordinary muscle car this type of traction bar may present a serious problem. Not only in ground clearance but these bars can stiffen the suspension considerably and provide less comfort for the passengers. When it comes to a streetable traction device what is needed is something that limits wheel hop, prevents spring and axle wrap, and increases traction. But that's not enough, it still has to allow the suspension to move and work as designed so comfort and derivability aren't adversely effected. Perhaps the best idea so far is what has commonly become known as "Caltrac Traction Bars". Caltracs are made by Calvert Racing a company in Lancaster, California and represent probably the most cost effective way to transfer the rotational energy created by the axle to down force on the suspension which definitely improves traction. This design transfers this rotational energy through a bellcrank system and actually pushes down on the spring instead of up as on the classic traction bars of the past. Since they are generally designed for high horsepower applications, Caltracs are very heavy-duty devices and can in this writer's opinion be rather expensive. Since most of us aren't driving a 600 + hp Sportsman Class race car on the street, at least not for everyday driving, we don't need the "heavy duty" aspects of Caltracs but we still want all the benefits they provide. The solution is simple. Building your own version of the classic Caltrac design isn't as hard as you may think and it only requires the basic tools any "gearhead" will have around the garage and chances are if you don't have what you need, you have a friend who does. Now I'll be the first to admit that I'm no engineer but I do know what works. This system has been proven by some pretty big names in pro-stock drag racing and that's more than enough proof that this concept works very well. Under acceleration the axle naturally tries to rotate. This "climbing of the pinion gear on the ring gear changes the pinion angle and general geometry of the suspension. In many cases it causes the spring to deflect or "wrap up" (see figure 3) which increases the change in pinion angle (among other things) and complicates matters even more. To effectively eliminate these problems the rotational force of the axle must be redirected or transformed to a force that helps weight transfer and traction. This bellcrank and rod traction system directs the rotational energy created by the axle through a rod to a bellcrank located on the front spring eye. There the energy is converted to down force on the front of the spring where it is weakest. This eliminates spring wrap and at the same time helps to force the suspension to the ground providing an increase in available traction. Simple but extremely effective. You'll need a grinder, saws-all or similar device for cutting 3/16" steel plate, a welder, and a good drill or small drill press. Materials are easy. Just run down to your local scrap metal yard and pick up a piece of 3/16" steel plate about a 1'x 2' and 8 feet of ¾" ID (1"OD) steel pipe. You will also need about one foot of 5/16" ID steel pipe. To connect the brackets and bellcrank you'll need (4) ¾" rod ends and 8 matching nuts along with a total of at least (4) ¾" bolts and nuts, (8) ¾" washers along with (2) 5/16" bolts, nuts and 4 washers. The length of these bolts will be determined by your specific application so it's best to make the brackets first and then measure for bolt length once you test fit them on the car. The big advantage of building your own traction bars is obvious. It can easily be done in a weekend and the cost will be well under a hundred bucks. Not bad when you consider the price of the real thing. The first brackets you need to make are for mounting the force transfer rods to the bottom of the spring retaining plates. (See figure 4) On most applications mounting the rod at a point 2" below the plate should allow enough clearance for the rod to connect to the front bellcrank without interfering with the spring. Be sure to check this before spending the time to make brackets that might be too short. 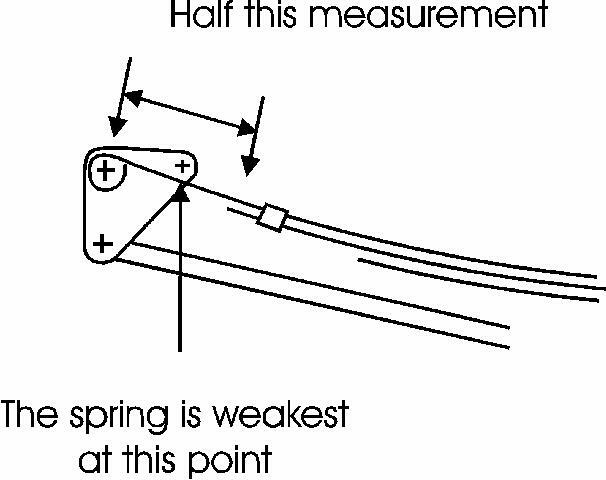 Start by measuring the distance from the front spring eye to the first spring. Take half of that measurement and it will tell you how far below the spring eye bolt the rod will attach to the bellcrank. On average this measurement will be in the neighborhood of 6". The rod should be able to miss the springs by at least 1". If it doesn't, these lower brackets will need to be a little longer. You will need to make four of these brackets and drill a ¾" hole in each. They will be welded to the bottom of the spring mounting plate with the attachment hole directly centered under the axle. Now we need to turn our attention to the bellcrank. You'll need four identical pieces here too. The first thing you need to do for the bellcrank is to determine where the spring is going to deflect or wrap up the most. In this case use the same measurement you used previously. Half of the distance from the front spring eye to the first spring. This is the spot where the spring is a single leaf and is weakest and this is where you want to put down force on the spring to keep it from wrapping up under acceleration. See figure 5. To keep the forces equal the bottom hole of the bellcrank should be the same distance from the pivot point as the pressure point. In this example the measurement from the spring eye to the second spring was 12". We use half that measurement (6") to determine the length of our bellcrank. (See figure 6) Don't forget that you need 4 identical brackets. 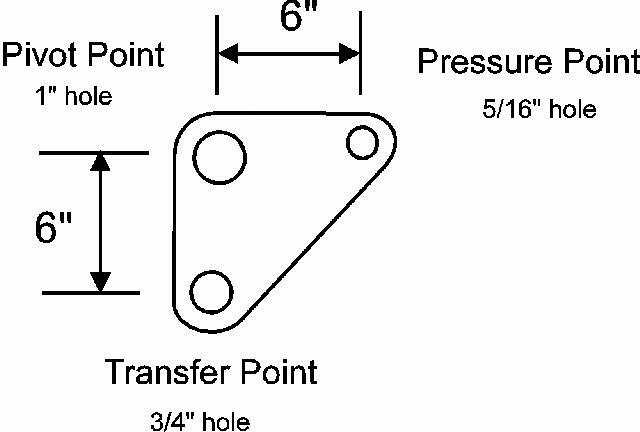 The transfer point hole needs to be ¾" to accept the rod end and the pressure point hole should be a minimum of 5/8". In our example the pivot hole diameter should be 1" because the current bolt size is 3/4" and we'll be using a piece of scrap 3/4" ID (1" OD) tubing left over from cutting the transfer rods to length as bearings for the bellcrank. Your application might be slightly different so the hole size you drill in the bellcrank might be smaller. What you are shooting for is to use a small piece of tubing with the same ID as your bolt to act as a bearing for the bellcrank. If your bolt is 9/16" then use that size ID tubing for the bearing and drill the hole in the bellcrank the same diameter as the outside diameter of the tubing you're using. The fit doesn't have to be exact but you don't want very much slop either. See figure 7. Now we'll turn our attention to the bellcrank. First remove the bolt and nut holding the front spring hanger in position. This will usually require a jack under the frame to remove any tension that may be on the bolt. Once its removed you'll have to replace it with one that is at least ¾" longer. The bellcrank assembly will go into position using a small piece of 1" OD thick wall tubing (the same stuff you bought for the actuator rods) and a couple of washers on each side so you need to make room for those with a longer bolt. Cut four pieces of 1"OD tubing ¼" to 5/16" thick. These pieces will act as a bearing for the bellcrank brackets to rotate. Make sure these pieces are thicker than your bellcrank material and that they fit in the 1" hole in the bellcrank with little or no slop. 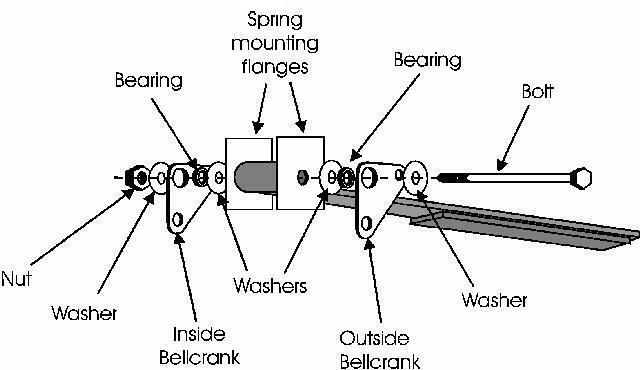 See Figure 9 for proper assembly of the bellcrank. When the assembly is complete the two halves of the bellcrank should be able to rotate with little or no effort. The small pieces of 1"ID tubing and the bellcrank bracket should be sanwiched between two washers and the whole thing bolted through the spring eye bolt hole. Once the bellcrank brackets are bolted in place you can cut your 5/16 ID tubing to length. This tubing runs between the front holes of the bellcrank and above the spring. It is secured by a 5/16" bolt and nut. Remember just the same as the other bolts the length will depend on your particular application. Figure 10 shows how this goes together. At this point all that remains is to assemble the transfer rod and rod ends. The transfer rod is made of the same 1" OD (3/4" ID) tubing you used for a bearing on the bellcrank brackets. First you'll need to install two bolts on each of two rod ends. Run the bolts up till there is about ½" of thread remaining. One bolt will eventually be welded to the transfer rod and the other will be used as a lock nut. Now temporarily install the rod ends in their respective brackets with ¾" bolts and nuts. Don't worry about the washers yet, this is just temporary. Measure the distance between the lower bolts on each rod end and you will have the measurement for your transfer rod. See figure 11. It is very important that the bellcrank pressure bar (the part you just previously installed) be resting on top of the spring when you take this measurement. Once you have the two transfer rods the right size weld one of the rod end nuts on each end of the bar. The best way to do this is to thread one all the way up one rod end, slide the rod end into the tubing and tack the nut in place on opposite sides of the tube. Unscrew the rod end before it gets too hot and finish welding the bolt to the tube. Do this on each end. When you're done thread a bolt on each rod end up to the top of the threads and then screw the rod end into the nut on the end of the tubing. First bolt one end of the transfer rod to the brackets on the axle retaining plate. Don't forget to use a ¾" washer on each side of the rod end (inside the brackets). This is important for proper movement. To install the bellcrank end of the transfer rod you have to cut a couple spacers first. Measure the thickness of a rod end plus two washers. Then measure the inside distance between the two sides of the bellcrank at the mounting location. Subtract the width of the rod end and washers from this measurement and divide the answer by two. As an example… if the measurement between the two halves of the bellcrank is 5" and the thickness of the rod end plus two washers is 1", the difference is 4". Divide by 2 and you have 2". This is the size of your spacers. Cut the spacers (you'll need 4 total) from scrap ¾" ID tubing. These spacers will keep the rod end centered in the bracket. See figure 12. At this point you're installation should be complete. Remember to adjust the transfer rod so the pressure point is just resting on the spring. Do this with the weight off the wheels for best results and once adjusted don't forget to tighten the lock nuts on all the rod ends. There you have it. For less than a hundred bucks in materials you can solve almost any spring wrap or traction problem you may be experiencing. This is not meant to be the only way or even the best way to tackle this problem, just the way I decided to do it. I sincerely believe that in all but the most severe racing conditions this setup will serve you well. However, if you have a mega horsepower big block powered street machine, I suggest you spring for the real thing. These bars are not designed for heavy duty racing conditions but for a street rod, they should be more than adequate. Good luck with your installation.